U Thong art flourished in Central Thailand between the 12-15th century A.D. in the period when Khmer influence was diminishing or disappearing and before and during the early stages of the Ayutthaya Kingdom. As such U Thong style was influenced by previous and contemporary styles in the region. Depending on prevailing influences and the time frame, U Thong Buddha images are often subdivided into three groups. 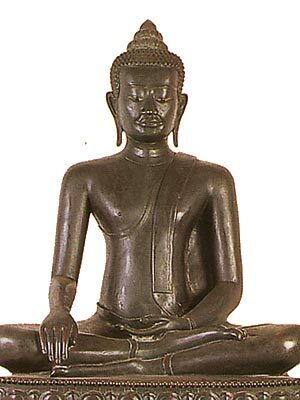 Typical of U Thong Buddha images is a small band between the hairline and the forehead. The head features small curls. 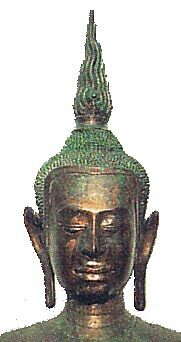 The face of the Buddha image is rather square with Mon and Khmer characteristics. During the early period the ushnisha (prominent bump on the top of Buddha's head) is topped by a lotus bud. 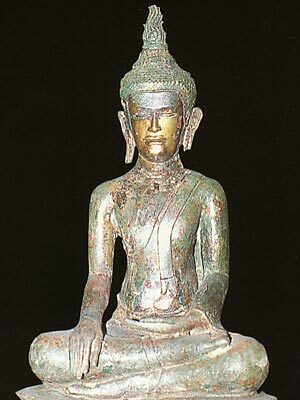 In later period (Sukhothai influence), this is replaced by an elongated flame. 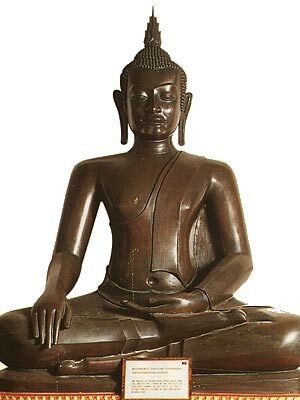 The face became more oval later on, and the body more elongate under the influence of the Sukhothai style. The eyes are cast (not inlaid as often the case with images of the Ayutthaya period). The robe is draped in the open mode with a long flap over the left shoulder (see image below) ending above the navel. 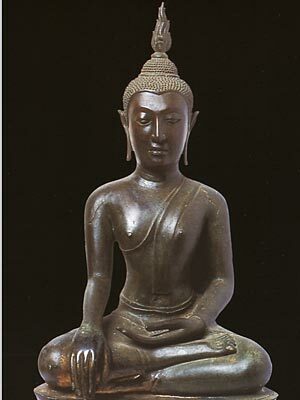 U Thong style Buddha images mostly display the gesture of Subduing Mara in the sitting position, and the gesture of Dispelling Fear (Abhaya Mudra) in the standing position. Bronze Buddha Subduing Mara, detail. 2nd period of U-Thong Style, 15th Century. Notice the band between the hairline and the forehead. 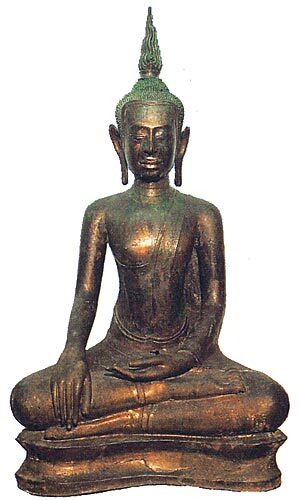 Sitting Buddha image, with the gesture of Subduing Mara. In the style of the U-Thong period. Found at Wat Mahathat, Muang San, Chainat province. Cast and enlarged from an ancient model. Standing Buddha image, with the gesture of Forbidding the Relatives from Fighting. Found at Wat Ratchathani, Sukhothai province.